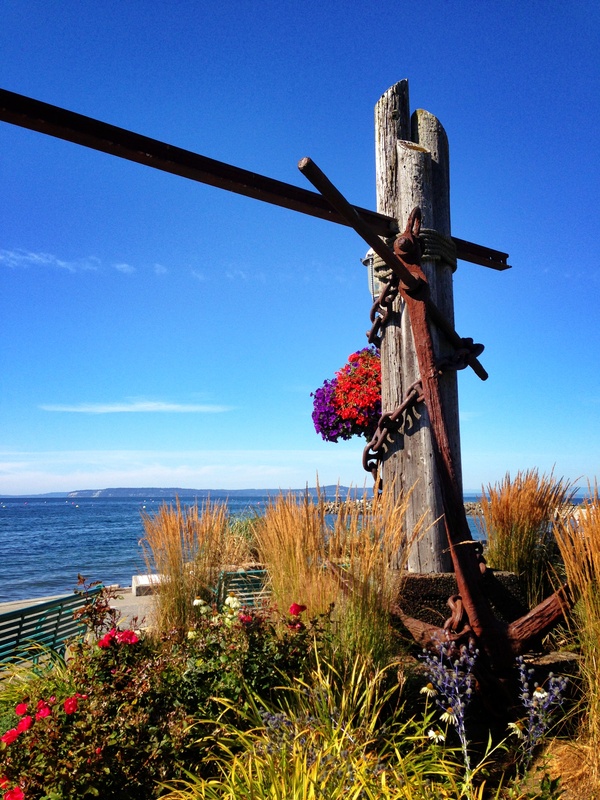 The skies are just the bluest of blues out in the Pacific Northwest…just takes your breath away. I like the perspective of the photo. Beautiful colors! Thanks Amy. 🙂 Everything was in bloom at the right time and I thought it was so pretty we had to stop for a picture! The post made me curious. There are beautiful flowers and there are chains. The sky and water are so beautiful, you make me want to live in the Pacific Northwest. But, when I lived in San Diego, I missed my family on the East Coast. Besides the beautiful geographical location, your lifestyle seems so much more laid back and less stressful. The horizon is also amazing! Aw thanks Rob, this is nice to hear! We have our share of stress here but spending time by the water always helps me relax. Knowing family is near is a huge help too, it is hard when everyone is spread apart. The chains are part of a large anchor but you’re right it is a little funny to see them side by side with summer flowers if you didn’t know the harbor was just on the left side of the photo frame! Thanks Sonel, every year the town plants the most beautiful flower baskets! Love the colours and my eye keeps being drawn to the left wondering what is at the other end. I’m glad you like the colors. 🙂 Sorry to say the other end isn’t very exciting…just another log holding the bar up and framing the entrance to the park. Still I think it creates a great effect…has one wondering etc..
Oh my goodness, so very lovely, I’m speechless here!!!! WOW.